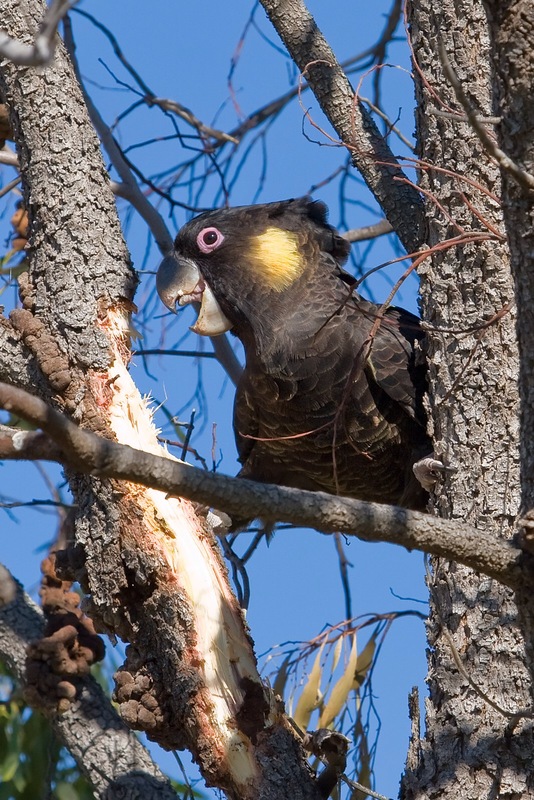 There are five species of black cockatoos in Australia – red-tailed, glossy, yellow-tailed, Carnaby’s and Baudin’s black cockatoo. Cockatoos are similar to parrots in many ways including having a curved beak and what’s known as a zygodactyl foot, which means two toes face forward and two face backwards. However, cockatoos do have unique features that parrots don’t have such as a gall bladder and a moveable crest on top of their heads. Cockatoos are larger than parrots and can never be green or blue in colour as they lack a special feather composition giving parrots the ability to be blue or green. Cockatoos occur naturally only in Australia and on some nearby islands. Black cockatoos are endemic toy Australia, therefore found nowhere else in the world. more than 50 years old. name for these birds, kaka(k)tua. varied due to differences in their habitat preferences. also rely on pine plantations as a food source. short beak for breaking open banksia nuts. nest in winter and spring. captive cockatoos have been known to live into their 70s. by the common brushtail possum is also a threat. Records of the Yellow-Tailed Black-Cockatoo (Calyptorhynchus funereus) in the Geelong Region have been supplied by members of the GFNC during the past 10 years or so and John has analysed these and earlier records from other sources such as Belcher (Birds of the District of Geelong) and Pescott (Birds of Geelong). 4. Generated isolated records from Pettavel, Mt. Duneed, etc. Records were from late Spring to Early Autumn. i.e.. from Summer. Birds returned to the Otways for Winter. Records from North of Geelong may have been of birds from the Wombat or Enfield State Forests. This has all changed!! 1. Observations have been much more frequent. 2. The increase has come in two phases, 1993-6 and post-1996. 3. Maximum reported flock sizes have increased in two stages. Eastward extension along coast to Ocean Grove. Birds regularly reported from Geelong. Maximum flock size up to 43 from previous eight. Maximum flock size of 82. Much the same as 1994. Much the same as 1995. Records from both West and North-west of Geelong. Maximum flock size of 70. Birds seen regularly in Geelong for the first time. Expansion of range eastwards along coast to Ocean Grove. With one exception birds are not reported from the Bellarine Peninsula. Birds observed in open country toWest and North-west of Geelong at the end of the period. Maximum flock sizes range from mid-40s to low 80s as compared to eight pre-1993. A substantial change from the period 1993-6. Birds still present in Geelong. An increase in reports from the West and Northwest of Geelong. Significant increase along coast to East of Torquay with birds now regular at Ocean Grove. Regular reports from the Eastern Bellarine Peninsula. Regular reports from the Lake Connewarre area. A jump in maximum flock size to 165. Birds now present in the Western as well as Eastern Bellarine Peninsula. Maximum flock size of 150. Similar to pattern in 1996,1997and 1998. Only an isolated report from the Eastern Bellarine Peninsula. Large numbers in the Lake Connewarre-Leopold area. Steady two-phase expansion of range to the North and East. Birds present along coast to Ocean Grove after 1993. Birds present throughout Bellarine Peninsula from 1997. Birds present in Geelong since 1993. Birds present to West and Northwest of Geelong since 1996.
up to 165 in 1997-9.
only in Geelong, Ocean Grove, the Bellarine Peninsula and Leopold. in Summer and just before and after, and only in smaller numbers. What has happened? John’s guess, call it an hypothesis, is :- Pre-1993 the population was based in the Otways. Local records were of summer dispersal non-breeding birds to South and West of Geelong and along the coast to Torquay. Some birds may have spent some part of the winter in the Enfield State Forest. Between 1993 and 1996 up to 80 birds moved into the Geelong region. These wereWinter birds. They patrolled a flyway from Pettavel through Waurn Ponds, Belmont, to the Barwon River and hence to Queens Park and later Eastern Park by way of South and East Geelong. They appear to have dispersed, at least some of them, in summer to areas surrounding Geelong. Lake Connewarre, Ocean Grove and Bellarine Peninsula. Some of these continued to disperse throughout the Geelong region in Summer. Why so? Hypothesis is that there is insufficient Winter food to allow the population to over winter in the Otways and/or Enfield State Forest and that two groups of up to 80 birds have moved into the Geelong region in search of Winter food. (Trevor Pescott suggested that the birds could have originated from as far away as the Mount Gambier area). 1. the presence of Winter birds in Geelong and subsequently the Bellarine peninsula. 1. Whether the Winter food shortage is in the Otways, Enfield State Forest or other areas. 2. Whether Geelong’s winter birds are returning to the Otways to breed in Summer or are simply dispersing across the Geelong region in small groups. 1. How to get information on recent logging in the Otways and Enfield State Forest ? 2. 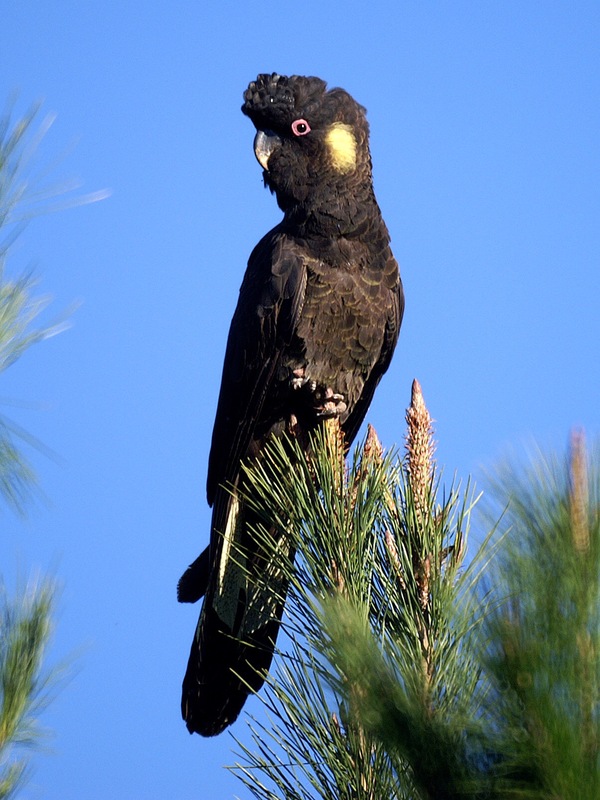 What is the pattern, frequency, numbers and seasonality, of observations of Yellow-Tailed Black-Cockatoos in the Otways and Enfield State Forest? 3. Are Geelong birds returning to the Otways to breed or staying in the Geelong region all year? 4. If the latter, is there any habitat suitable for breeding in the region? 5. Are they attempting breeding? Twenty birds spent the Summer around Lethbridge. 6. Where are they roosting ? John has answered many of the mysteries about the YTBC in Geelong, but he has raised many questions that need to be answered before we have a clear understanding of what has happened. The future for the YTBC is unclear. Are these long-lived birds doomed due to failure to breed or will they continue to breed in places unkown? The GFNC is pleased to allow reproduction of the article on Yellow-tailed Black-Cockies, with the proviso that it is duly acknowledged as per our copyright policy below. It is now a little out of date but large flocks have still been reported over winter, with up to 150 birds in the Brisbane Ranges and 80+ in Geelong or on the Bellarine Peninsula in 2011. The mystery of where the birds originated during the 1990s has never been answered, but it is generally assumed that they moved in to the Geelong area after pine plantations had been harvested somewhere. The Geelong Field Naturalists Club aims to make information accessible to a wide audience. This website and its contents are subject to copyright under the laws of Australia and, through international treaties, other countries. The copyright in materials in this website as a whole is owned or licenced to the Geelong Field Naturalists Club Inc. Unless otherwise indicated you may copy, distribute, display, download or print the material on this website for your own personal use, for non-commercial educational purposes or for non-commercial use within your organisation. You may not alter content and must attribute the copyright owner/author listed on this website, or the Geelong Field Naturalists Club Inc. where no author is listed. ← Fiesta of Fungi in The Otways!